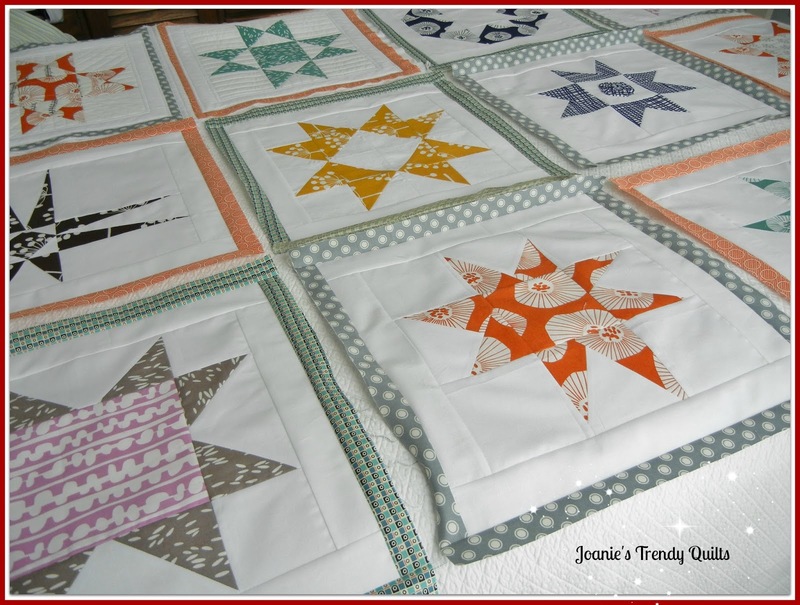 Joanie's Trendy Quilts : Whooping It Up Week! A Give Away to Celebrate! This week there were a couple of little surprises for me that gave rise to whooping it up!! It wasn't due to anything I did or accomplished much in the way of sewing or quilting because I was steep into taking care of client's stuff, stuff being reports and budgets this past week. Karen from Charlotte Modern Quilt Guild asked if she could feature the Raggedy Ann and Andy dolls that I shared during "Share and Tell." Practically jumping up and down I said of course! Want to read more about it you can find the story here by clicking on the button below. blog messages about the Rag Dolls. Woohoo!! I won, I won! Lily Pad Quilting hosted Pets On Quilts in August and I was 1 out of 26 who won in their drawing of many sponsored quilting goodies. Isn't this gorgeous batik fabric? I am still waiting for delivery. I was contacted earlier in the week by a Hoffman representative letting me know it was being mailed this week. This morning I finished the modern Andy Outfits for the 15 inch and 20" dolls. 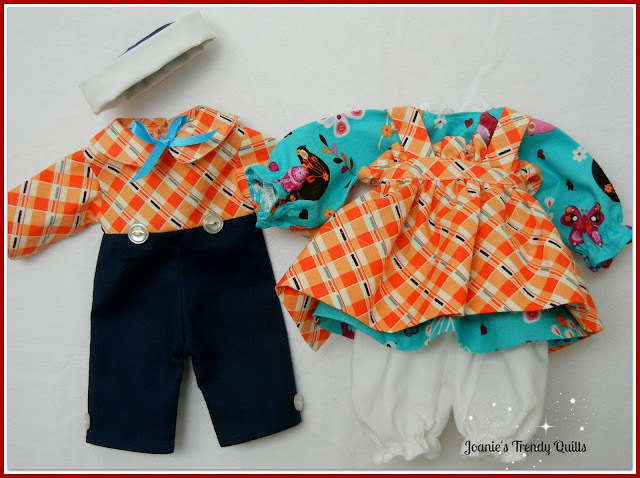 Below are photos of the companion clothing for 15" and 20" Raggedy Ann and Andy. I managed to add the frames to the star blocks during my busy, busy week! More whooping! On my dog tired days when I was too tired to sew I pinned an assortment of quilts on display. Inspiration set in. I took a few of the quilts made and displayed across the stair banner. A friend of mine has been asking, "How many quilts have you made? not once but twice. Both times I stated, I don't know I have lost count! Need some ideas on how to display? If so check out my "Quilt Board Display" on Pinterest. Since it has been a Whooping Up week I thought I would celebrate with a giveaway! There are 20 pieces of pastel florals, stripes and other designs in this roll. 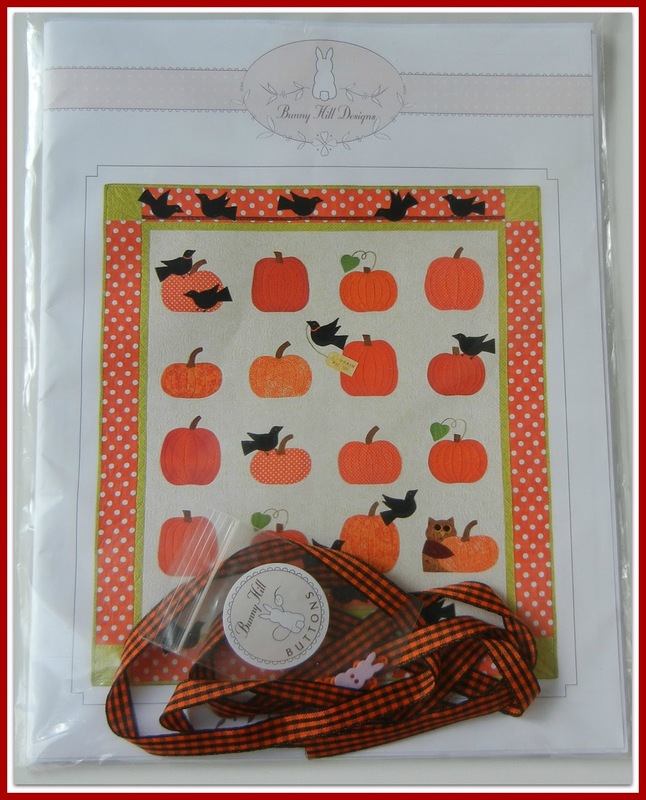 The pattern comes with black and orange checked ribbon, a bunny button and the teeniest tiniest round orange buttons. The giveaway begins today September 7th and will run until September 14th. The drawing will occur on Sunday, September 15th. So here are 4 opportunities on how to submit your name for the drawing. 1. Connect via Bloglovin, Google Connect or your favorite way to follow. Please tell me that you have and how you are going to follow. 3. Visit Charlotte Modern Quilt Guild's blog and come back and tell me that you have visited it. Thanks for visiting and whooping it up with me! Linky parties to go to this week. TGC - The Creative Girl. Buttons to the linky parties are here. Big follower! Bloglovin', GFC and even Facebook! So much to celebrate!! Love all your projects and seing all your beautiful quilts on display. Your Etsy shop is lovely. My favorite quilt is the house wallhanging. How special to have your dolls featured by your guild! I knew they were special! congrats on your win! what fun! those little outfits for your dolls are so cute. I follow on your blog on my Blogger dashboard. I did go by your etsy site. love that string quilt. I went by the modern guild blog. those name tags that were swapped sure are cute. what fun to play bingo too. I took the survey too. thanks for the giveaway. I visited your Etsy shop. I love your string quilt. Pretty, pretty colors. I took your survey. Thanks for the giveaway. I just wanted to say how much I agree... Adorable? Yes! Those two new clothing sets are Sew-Weet! Glad to hear your dolls are getting the publicity they so deserve. Congrats on all your progress this week! Wow! I am impressed with all you have accomplished in one week! I also LOVE your Anne and Andy dolls. I follow you thru LinkIn but now I see other ways too. I really loved your Cuddle Quilt but then I love cats so it caught my eye. I also checked out the Guild and think its awesome that you are all making bags for Red Cross volunteers...something I hadn't thought of that they might need. And I took your survey too! I follow you via Bloglovin. I've enjoyed your progress on quilting the Craftsy BOM. Love the Crazy Hearts wall hanging in your Etsy shop. I visited the Charlotte blog. Sounds like a generous and busy guild! I took the survey. You do such a nice job on your dolls! Congrats on the wins and great things going on! What a great giveaway, I follow you with GFC. HELLO,love the "Crazy Hearts" on Etsy! Joanie I'm so happy for you and very inspired by your display of quilts! I enjoyed visiting the C Modern Quilt guild! I'm whooping it up with ya blog friend! No need to enter me in the giveaway, but I wanted to tell you how much I like those Raggedy Ann/Andy dolls. I made some long ago, and they are just the sort of things to fall in love with all over again--fun to see them! Congrats on getting your borders on your stars--they are wonderfully lovely to look at! Raggedy Ann and Andy set would be my favorite. 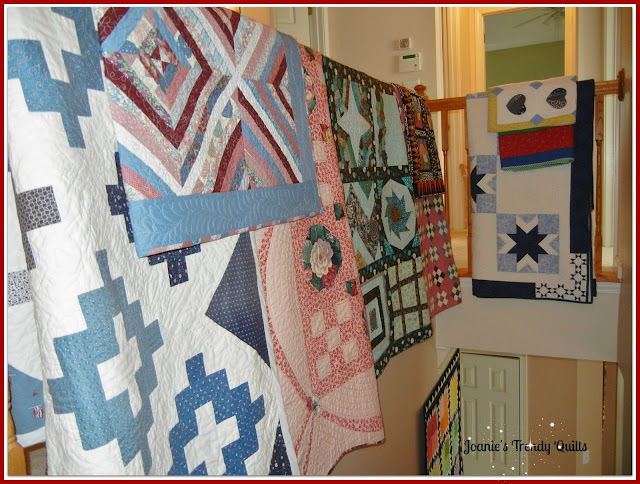 Charlotte Modern Quilt Guild's blog - saw your dolls there. Every think of using red or red/orange yarn on your dolls instead of orange. Took Survey, give choices to colors of outfits and hair, maybe even skin tones. Your Raggedy dolls are very pretty. I visited your Etsy shop. 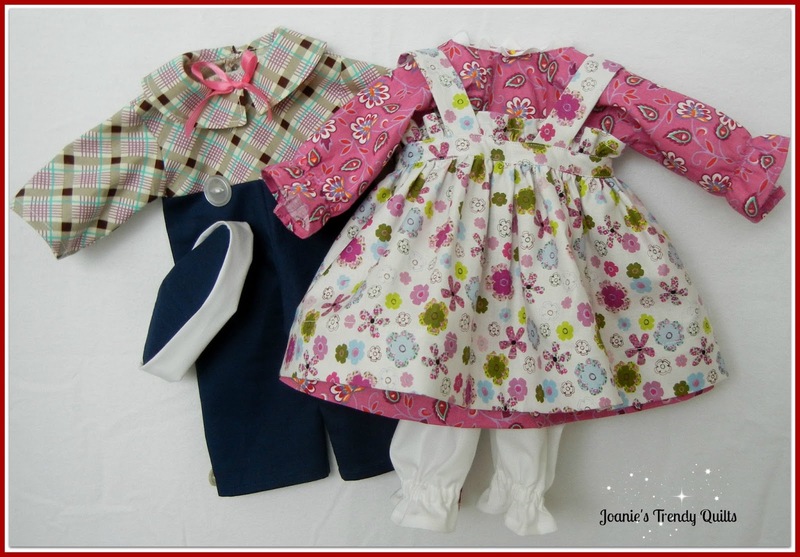 Those doll clothes are way to cute! I love the star quilt as well, so pretty! Thanks so much for stopping by chapter37! I visited Charlotte Modern Quilt Guild. Thanks for sharing. I visited your Etsy shop Joanie and your cuddle quilt is adorable! Hi Joanie! I visited your modern quilting site. 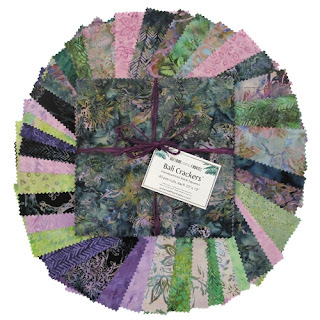 I've just joined Maine Modern Quilters and wanted to see your site. Thanks for sharing, and congratulations on your win.